My post, titled ‘Spiders do not bite‘, remains the most frequently visited post on my blog, receiving hundreds of hits each week. It was written over a year ago, and has received quite a number of interesting comments. Some people decide to comment without actually reading the post (! ), and by in large, these comments come from people who just can’t be convinced that spiders rarely bite people. In other cases, people comment with a big “Thanks“, as the post has provided them some comfort (this is a key reason why I wrote the post). The title of that post was meant to be provocative, and to help swing the pendulum a bit, and be an antidote to the garbage out there on the Internet about spiders bites. I remain emphatic: spider bites are exceedingly rare and other causal agents are much more likely. Just recently, I was thrilled to see another paper published by Rick Vetter (a well respected Arachnologist who has worked on debunking myths about spiders). This recent paper is titled “Spider Envenomation in North America” and was published in the journal Critical Care Nursing Clinics of North America. The paper was aimed at Nurses and to a lesser extent, Doctors, and gives frank, clear and concise information about spiders and spider bites. Bingo. Spider bites are exceedingly rare! Here is some more detail and context: there are only two groups of spiders in North America which can truly be considered ‘medically important’ – some species within the ‘widow’ group (e.g. black widows) and some within the ‘recluse’ group (e.g. brown recluse). Here’s a lovely photo of a brown recluse spider, courtesy of Matt Bertone (thanks, Matt, for permission to post the photo here!). A beautiful brown recluse spider. Photo © Matt Bertone, reproduced here with permission. Much of Rick’s article documents the effects of bites from these two groups of spiders, and without a doubt, verified, real cases of spider bites from these two groups can certainly affect your health. Rick provides a clear list of symptoms and also discusses treatment options (including what used to be done, historically e.g., cocaine treatment for widow bites in the early 1900s). He also points out that the actual number of recorded, verified bites by spiders are quite rare, even in regions where widows and recluse spiders live in proximity to humans (um, I have to state that because recluse spiders are continually blamed for bites in areas well beyond their range!). Without doubt, poison control centres, Doctors, and other health care professionals hear panic about spider bites, and certainly see cases of lesions that are attributed (often by the affected person) to recluse spiders. So, if it’s not spider bites, what is causing lesions? Thankfully, Rick provides an answer, and I quote from the paper: “Possibly the most important advance in spider toxicology is the realization that many skin lesions that were attributed to spider bites were actually bacterial infections… Another study showed that of 182 southern Californian patients seeking treatment for spider bites, only 3.8% had actual spider bites while 85.7% had infections“. So… more likely causal agents should be investigated. Here’s a table from a 2003 publication by Vetter et al. 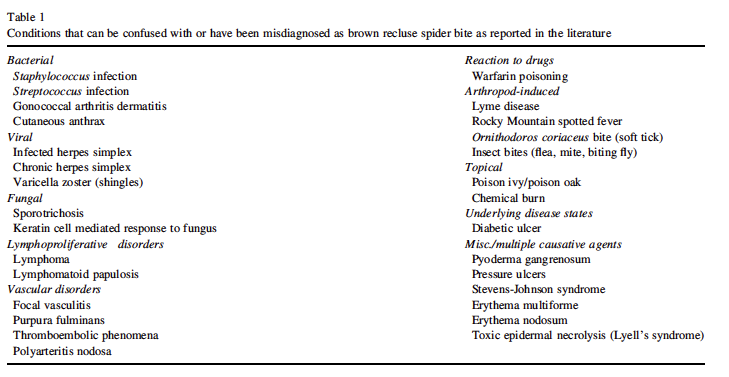 that lists some of the potential causal agents that could be confused with brown recluse bites. In sum, I remain steadfast in the claim that spider bites are exceedingly rare. Furthermore, there are very few species that are medically important, and of the thousands of spider species that exist in North America, few warrant any concern or fear. Spiders are our friends. Arachnids deserve positive attention. I have seen significant change in the medical literature where they are quoting my papers a lot and telling colleagues to be cautious with their diagnoses. There are still those out there that continue to misdiagnose but I think that they are now in the minority. This is great news, and I am heartened. That being said, I think we must continue to provide clear and accurate information to a broad audience and to the news media. I believe general paranoia and hysteria about spider bites is still high despite a potential shift in diagnosis from the medical community. My brother was bitten by … something … many years ago. He had developed an allergic reaction to … something … and looked like someone had worked over his face with a baseball bat. He remembered having fallen asleep outside, and woke when he found a spider crawling on his face. The doctor promptly diagnosed it as an allergic reaction to a spider bite, and set him up with an antihistamine. Since then, my brother has always believed that he is allergic to spider bites. Also, I thought Jeff Hanneman of Slayer was killed by necrotising faschitis caused by a spider bite. Not? Craig – thanks for the comment. I can’t say I’m surprised that the antihistamine helped – probably would have helped even if it wasn’t a spider bite! I doubt that your brother is allergic to spider bites. Sure, spiders can bite, but bites are very, very rare. That’s the point – it’s easy to blame spiders because they are everywhere and easy targets. In most cases, other agents are the cause, and not spiders. My guess would be that it was an allergic reaction to the spider, but not to it’s bite, but to it’s body, like people who are allergic to cats are allergic to their skin-particles, not to their bites (well, they could be, if the allergen is in the saliva too, but you don’t have to get bitten to have the reaction), or like people who are allergic to dust mites aren’t allergic to their bites but their skin-‘dust’. Do you have a copy of the paper you could send me? I haven’t been able to get my hands on one! Fascinating stuff! It’s hard to ignore that initial, “but… but… that’s not what I was told!” reaction, but I’ve never researched spiders a day in my life, so I’m going to believe you. … was particularly fascinating. 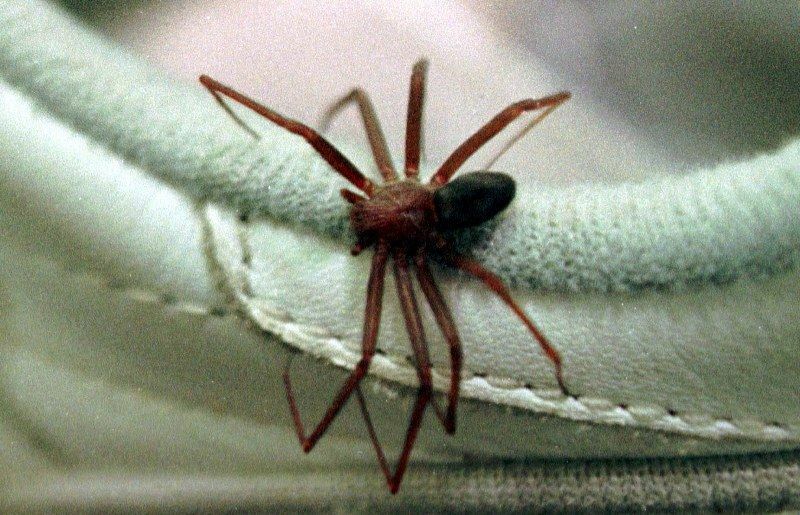 Do you think that Hobo spider bite diagnosis are similarly unreliable? I know a man who has been treated for a necrotic “hobo spider bite” twice now, and this is making me wonder if it was a misdiagnosis. Thanks for the comments and questions, Ryan! 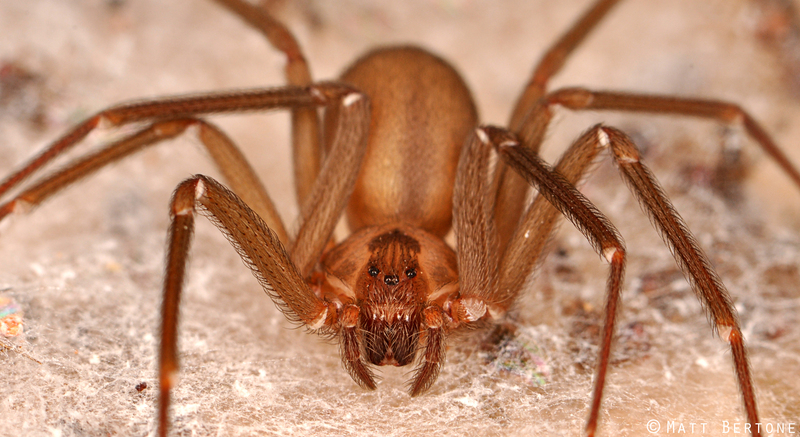 The story of the hobo spider is fascinating, and some details are here: http://discovermagazine.com/2005/sep/bite-of-the-hobo-spider#.UboNHJV0DzI (make sure to read page 2). My personal view is that Hobo spider bite diagnosis are similarly unreliable. Vetter’s article also supports this view. Thanks for the link! Really interesting stuff. Several times in the last few years I’ve had friends claim they had a spider bite. All of them looked more like something I have had a lot of, fire ant stings or a fire ant sting that got infected. Those are, IMHO, very common in the south. The stings start as a burning/itchy bump where the ant bit the flesh and injected their poison. If you leave them alone they turn into a puss filled bump that is easily irritated. If you rub it it itches. Those suckers take weeks to heal completely and are prone to cycles of crusting over and the crust being rubbed off. And I have had a few get minor infections that cleared up with peroxide, A&E ointment and a bandage. At work a couple of us got into a fire ant nest and got stung. One of Bill’s bites got infected with MRSA. It had got to be around 3/8″ with an inflamed red ring. There were people who saw the wound and heard how he had to get medical treatment and announced that it was clearly a spider bite even after he related that it was a fire ant sting that got infected. You’re right, they don’t bite, I have never seen anyone bit by one anyway, I lived on a farm, they were all over the old barn, they never bothered any animal. Now I live in the suburbs, I used to take down spider webs in the garden and on window sills – until I realized they were keeping flies and mosquito populations down. Tip: Leave the spiders alone, they are killing more bugs than all the bug spray you use. I was bitten by a spider similar to this one: http://www.warrensarle.com/misc/Wolf_Spider_9506-9566.jpg (It’s a very large photo.) We have hundreds (maybe thousands) like this on my farm in Alachua county, Florida. I do not know the species or how many species we have. The spider was on a gatepost. As I passed through the gate at night, I got a phone call and neglected to examine the far side of the post for biting creatures. As I answered the phone and closed the gate, I carelessly swung my arm near the post and felt something like a pinprick on my forearm a couple inches from my elbow. Over the course of a few minutes, the pain increased to the point that I excused myself from the phone call, examined the gatepost, and found the spider. I assume that I scared her as I was closing the gate and she bit in self-defense. After half an hour or so, the bite felt like a wasp sting, and there was a reddish welt about four inches long. After two hours, the pain was gone. The next day, there was no sign of the bite. Hi Warren, and thanks for the comment. Yes, the ‘surprise’ probably did cause the spider to react in the way that it did. THANK YOU for verifying that it was a spider (i.e., you actually found the spider). And good to know that the symptoms were relatively mild. I was terrified. I found my cat playing with one in the bathtub. I caught one as it crawled up my boyfriend’s leg. I found them in the cupboards, pantry, under the sink, around my porch. I was terrified. Ironically, in the 2 years I lived side by side with this highly venomous, deadly spiders… no one was ever bitten. Not even the idiotic cat who turned a lethal spider into a play-toy. When I found out I was pregnant I caved and bug-bombed the place and haven’t seen one since. That was nearly 2 years ago. So yeah, spiders don’t just sit and wait until you’ve dropped your guard so they can ambush you and gnaw off your face. I almost miss them hanging around. Almost. I was looking for this article, as I was concerned about my Dachshund. Some of you may cringe at this, but she does not allow invaders into our home. Humans are allowed, but critters beyond that are not. Anything with more than six legs – an outright violation. If she even spots a fly or spider on the wall, the alarms sound and will not stop until the threat is dealt with. The other day, she spotted a spider walking up her ramp to the couch (she’s recovered from back surgery). Immediate alarms, then she lunged at the spider at picked it up with her mouth and sat it on the ground. I’m expecting spider bites on her tongue, and the wife immediately finds means to end the spider. No spider bites – how does any living creature not defend itself when attacked? This article somewhat helped my confusion, but there is a lingering question – can a spider not penetrate the tongue of a dog? I Actually do live in range of the recluse (Saint Louis, MO) but have only seen an old car wash infested with them. The wife has misidentified countless brown wolf spiders, though. I live in Brasil, and my town is known by the amount of Loxocelles accidents. Even with animals. There’s even a toxicology centre specialized in antivenom serum. Is all the fuss really necessary? The accident that happened to me was definitely a bite of which resulted in a bad allergic reaction. It didn’t hurt, I didn’t actually find the spider, but “the signs were there” according to the health professionals: defined swelling that looks like “white and red marble” with a reddish middle around the two dotted bite. Many people (supposedly?) suffer skin necrosis and kidney damage, because of hemolysis caused by the venom. Everyone finds the eventual “brown spider” (as we call it) in their homes and the news about accidents come and go. The only thing I’m sure if you put more than one together there will be only one left the next day and I only find one (brown spider) eventually in my house. There are a lot of other spiders in my house I don’t care about though, they never bothered me. http://imagem.band.com.br/f_75403.jpg This is the only one I fear. 😛 Can I stop worrying now? This man who writes these articles is acting foolishly, there is also Hobo Spiders in North America and possibly many more Spiders that are dangerous. As well, I frequently get bitten by spiders that are not dangerous. Spiders do bite, just not every Spider bites, I’m sure this man would love handling a Hobo Spider and being friendly with it even after he gets paralyzed from the neck down or even killed from that Spider’s bite.. So what if people went to the Hospital reporting a spider bite that didn’t really have one? It’s better to be safe, than to lose a limb from something that could be prevented. To me, these articles look like they are trying to lower people’s awareness of the dangers associated with Spider’s. I saw this site after searching google when my friend asked me to identify a spider that had it’s fangs sunk into his leg one night he woke up from the pain. I really do not think so, but was that Spider just being extra friendly and that was some kind of Spider kiss? Thanks, Joshua, for that comment. Indeed, the fear about hobo spiders is really unfounded. I have a question I was hoping someone here could help me with. I live in Western Massachusetts and the other day, I woke up to find a Huntsman spider crawling up the wall near my pillow. My question: If I burn the house all the way to the ground, will insurance cover this? Have you any data for Australian conditions? I don’t have any new data about Australia -sorry! Thank you for that link! I will indeed try to connect and provide some rational arguments as to why their wording needs to change! I have a spider bite on my face right now. Woke up to it biting me. I have been bitten dozens of times in my life. Of course spiders don’t want to bite humans because they can get smooshed but those tiny fast hunting nocturnal spiders will bite you if you move in your sleep a lot. The bite is never very bad. Less itchy and smaller than a mosquito bite except for maybe 10% which are just a little worse and weepy. I don’t think the more nasty spiders bite people often because they are usually in dank wet places and want to be left alone. MOST spiders don’t bite. but some are flesh eaters and are attracted to corpses by smell. most people are bitten on the feet (while sleeping[usually on the soft skin adjacent to the toes]) because feet have more dead skin than rest of the body. the venom from these flesh-eating spiders accelerates decompisition and creates a hole in which they may enter,nest,and consume the corpse from the inside out.so keep those feet clean. I may have been bitten by a black widow back when I was thirteen. I recall going to bed feeling a little feverish. Than I went through a period of not being fully awake but not being asleep ether. I fully woke up in the ICU to discover several days had gone by, and there was a big hole in my arm. I was told by the doctors that it was Necrotizing Fasciitis brought on by a black widow bite. For some reason, I’m not entirely sure I was actually bitten by a black widow. I live in the Pacific Northwest, and I am pretty sure we don’t have black widows up here. I did respond well to the antivenom though. The only way I can think of that I came into contact with a black widow is when I had to dig into a large box of bananas to find the one my mom wanted at a store. I don’t remember any sting or pain, but I did have a reddish area on my arm.